Mrs. Margie Clemons Millican, age 90, of Rockmart, GA passed away Wednesday, January 30, 2019 at her residence. She was born on August 14, 1928 a daughter of Willie Clemons and Bertha Mae Swann Clemons. 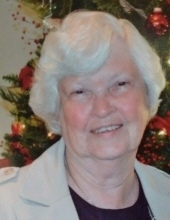 Mrs. Millican had lived the greater part of her life in Rockmart where she was a member of the Piedmont Avenue Baptist Church but had most recently attended the Morning View Baptist Church. She retired from the Goodyear Mill where she was employed for thirty seven years. Mrs. Millican loved her family and raised a number of her grandchildren in addition to her children. She was preceded in death by her parents, a daughter, Sandra Garrett; two granddaughters: Angie Proctor and Kim Millican; by two sisters: Wilma Davis and Betty Kinney and by a brother, James Clemons. Survivors include a son, Gary Ingram and his wife Patricia, Silver Creek; a daughter, Linda Sue Pate, Rockmart; numerous grandchildren, great grandchildren and great great grandchildren; a number of nieces and nephews also survive. Funeral services will be held Saturday, February 2, 2019 at 2:00 pm in the chapel of the Alvis Miller & Son Funeral Home with Rev. Charles Dyer and Rev. Gary Ingram officiating. Interment will follow in the Rose Hill Cemetery. Pallbearers will include: Shane, Gavin, Derrick and Branson Ingram, Ashley Wooten and Gavin Langford. The family will receive friends Friday evening from 6 until 9 pm at the funeral home. The Alvis Miller & Son Funeral Home is in charge of arrangements for the funeral of Mrs. Margie Clemons Millican. To send flowers or a remembrance gift to the family of Margie Clemons Millican, please visit our Tribute Store. "Email Address" would like to share the life celebration of Margie Clemons Millican. Click on the "link" to go to share a favorite memory or leave a condolence message for the family.